MTSU’s new Agricultural Education Leadership graduate program offers the opportunity to study agricultural leadership and its application in a variety of agricultural and environmental contexts. This concentration leads to a Master of Education (M.Ed.) degree in the Administration and Supervision major. The program helps disseminate the latest research and best practices in agribusiness and agriscience to educational leaders such as extension officers, FFA club advisors, 4-H leaders, and K-12 teachers who integrate agricultural content into their curriculum. Electives allow master’s candidates to tailor studies for individual career goals. 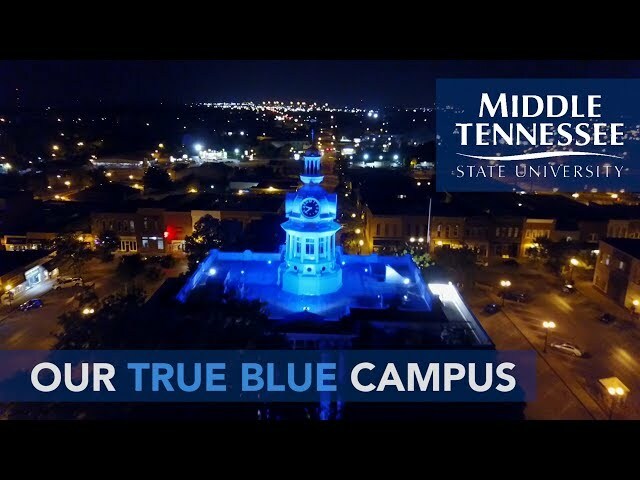 The program draws upon the expertise of School of Agriculture faculty and builds on MTSU’s strong foundation in K-12 education. Although not traditionally identified as STEM fields, agribusiness and agriscience rest on the ever-growing and ever-changing currents of science, technology, and engineering that require agricultural leaders to remain up-to-date in scientific arenas, apply that knowledge to agribusiness and agriscience, and communicate that information to a variety of audiences in a number of formats. Smith County High School agriculture teacher Wesley Foster, a Plant and Soil Science graduate from MTSU, plans to finish his master’s through the new Agricultural Education Leadership program. Foster took three graduate classes before being hired mid-semester in 2012. “This new master's program will benefit me personally because it is focused more toward me and what I do in my classroom,” he says. “Before, the program was aimed more toward an administration position rather than toward the agricultural side or the teaching side.” Foster has increased agriculture enrollment from 104 to 195 at Smith County and FFA membership from 68 to 126 as advisor. “Agriculture is changing day by day by day, whether it’s seed varieties, precision agriculture, or the mechanics on agriculture equipment,” Foster says. “Everything involved with agriculture has exploded within the past 10 years, so it’s hard to keep up.” Foster also co-owns and operates his family’s 1,500-acre farm in Cannon County. With leadership being a mandate of employers, the Agricultural Education Leadership master’s degree positions graduates to work with communities, organizations, and agencies that are committed to agriculture and the environment. The program is geared toward agricultural extension agents, 4-H leaders, recent graduates, and teachers who seek advanced agricultural leadership skills. Because this degree program is new, employer information is still being compiled. The Master of Education (M.Ed.) in Administration and Supervision now offers a concentration in Agriculture Education Leadership, as well as specializations in K-12 public school, higher education, and a nonlicensure program. teacher licensure (can be waived). Curriculum consists of 9 hours core classes, 12 hours of specialized coursework, and 12 hours of electives. Students must select 12 hours from graduate-level elective courses in the College of Basic and Applied Sciences, the Jones College of Business, and the College of Education. A minimum of 6 hours must be taken from courses with common rubrics (i.e., FOED, SPSE, YOED, ABAS, MKT, MGMT). For example, a student who planned to teach in a K-12 setting could pick up additional courses in the College of Education. However, a student who planned to lead a 4-H or agricultural extension might choose further courses in the School of Agriculture. The Womack Educational Leadership Department awards the Master of Education degree (M.Ed.) with majors in Administration and Supervision, Curriculum and Instruction, and Professional Counseling. Master’s graduates may pursue the Specialist in Education degree (Ed.S. ), with majors available in Administration and Supervision as well as Curriculum and Instruction. Administration and Supervision, Agricultural Education Leadership, M.Ed. Students pursuing an M.Ed. degree must be fully admitted prior to their initial semester of coursework. complete 33 semester credit hours: 9 hours of required courses (Educational Foundations, Analysis and Application of Educational Research and studies in Leadership), 12 hours of specialized core courses, and 12 elective hours). The 12 specialized core hours are housed in the School of Agriculture (History of Agricultural Education, Program Development of for Agricultural Leaders, Foundations of Agricultural Leadership, Diffusion of Innovation and Group, Team, and Organizational development in Agricultural Organizations). The 12 elective hours are selected with an advisor based on the career plans of the student. successfully complete a written comprehensive examination during the semester of graduation (exam may be taken once). Explores the nature and history of selected philosophical concepts and philosophers and evaluates their influence upon education and agricultural education in the United States. Identifies and defines leadership, as well as identifies styles and roles of leadership. Explores development techniques and skills required in working in and with organizations through reading, observing, applying, creating, and evaluating leadership. Introduces theories of teaching and learning and related research. Explores trait, behavioral skills, situational approach, path-goal theory, leader-member theory, and other leadership theories. Explores applications of teaching and learning theory in the context of teaching agricultural subject matter. Examines leadership as it related to organizations and their group and team behavior. Identifies styles and roles of leadership, development of leadership techniques and skills required in working in organizations and youth groups, methods of resolving conflict, communicating, guiding and evaluating leadership, and ethical consideration of leaders. Capstone course for the Agricultural Education Leadership concentration.